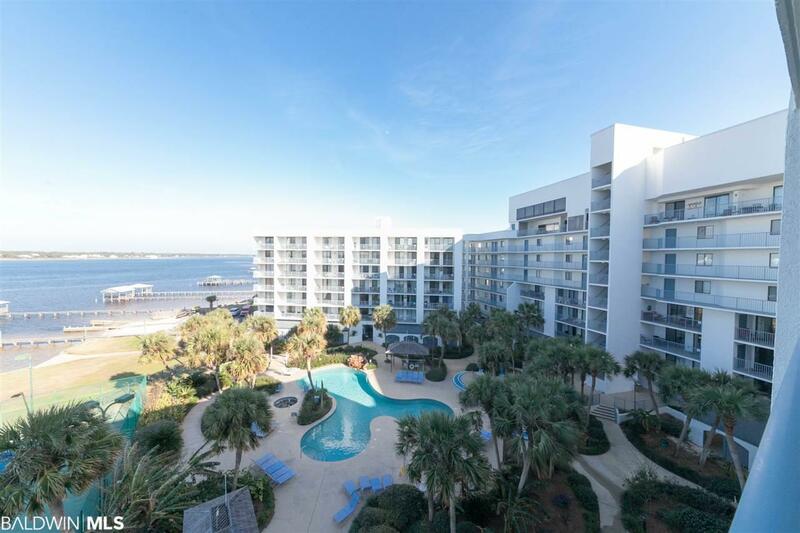 VERY NICE 2/2 on the 6th floor with amazing views at desirable Gulf Shores Surf and Racquet Club on West Beach Blvd. Situated on Little Lagoon with tons of amenities and A Private Beach front directly across the street. See Photos. This Condo has been updated and very well maintained. Granite counter tops in the kitchen and baths and nice cabinetry. large updated tile floors throughout the entire condo. Floor to ceiling sliding glass doors in the living, dining and Master bedroom that open up to a very large balcony where you can enjoys beautiful views of the Lagoon and the tropically landscaped pool area, and amenities where you can enjoy dining, sunbathing and relaxing. Very nicely furnished with coastal decor. This is a great opportunity to own a income producing property with 2 bedrooms and 2 baths that has awesome views. Amenities include private beach access, lagoon access, 2 piers. One with boat docs, fish cleaning station and the other is a perfect spot to view amazing sunsets with your favorite beverage. Boat ramp and boat lot storage too!. Want to keep active? 2 lighted tennis courts and shuffleboard await. Very low dues, No special assessments and very well managed association make this a great investment opportunity! This is a Win Win! Directions: From The Intersection Of Hwy 59 And Beach Blvd. Take A Right. Go Approximately 3 Miles West. The Complex Will Be On Your Right. B Building Is On The West Side Of The Complex.